The ingredients in this pesto have intensity but also a surprising sweetness. This pesto has multiple uses, and will leave your family and friends wanting more. Remember that pesto freezes well, so make a big batch and save any extra (you might find you have less extra than you’d planned!). Wash and pat dry basil, carrot leaves and carrots. Chop and add carrots first to food processor; pulse, then add basil and carrot greens. Continue pulsing. Add garlic, pumpkin seeds, lemon juice and nutritional yeast. Pulse, and start to drizzle in olive oil from the top. Don't be afraid to add more lemon juice, olive oil or nutritional yeast to get to your desired taste and texture! Some people prefer a thicker pesto, some prefer thinner, and for some (like me) it depends on whether I'm using the pesto on pasta, on pizza, as a garnish, a topping or a dip. 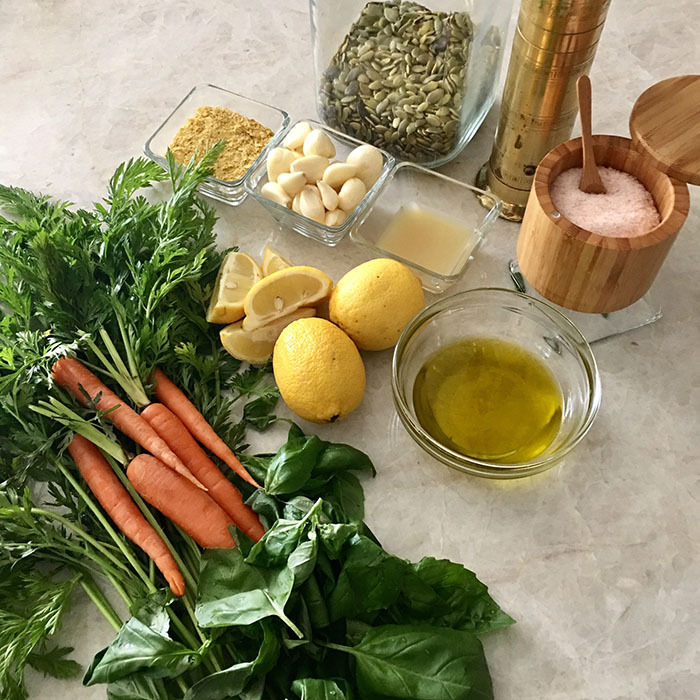 The basil and carrot in this recipe offset the sharpness of the nutrient-packed carrot greens (which are all too often discarded in cooking). The stems and leaves of many plants contain a majority of the plant's health benefits, so as a general rule, use the whole food as much as you can. Use this pesto as a dip, on pasta, spread on bruschetta, or as a garnish on top of anything you want.